FILANNINO, Michele ; DI BARI, Marilena. Gold standard vs. silver standard: the case of dependency parsing for Italian In: Proceedings of the Second Italian Conference on Computational Linguistics CLiC-it 2015: 3-4 December 2015, Trento [online]. Torino: Accademia University Press, 2015 (generated 19 avril 2019). Available on the Internet: <http://books.openedition.org/aaccademia/1475>. ISBN: 9788899200008. DOI: 10.4000/books.aaccademia.1475. Filannino, Michele, and Marilena Di Bari. 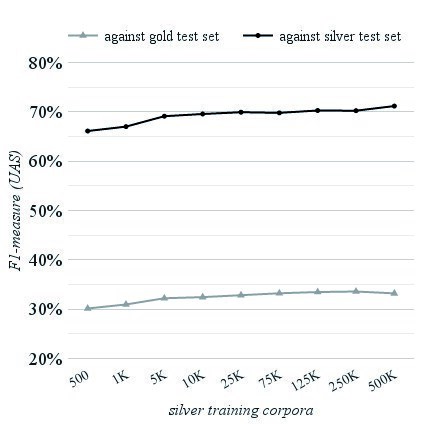 “Gold standard vs. silver standard: the case of dependency parsing for Italian”. Bosco, Cristina, et al.. Proceedings of the Second Italian Conference on Computational Linguistics CLiC-it 2015: 3-4 December 2015, Trento. Torino: Accademia University Press, 2015. Web. <http://books.openedition.org/aaccademia/1475>. BOSCO, Cristina (ed.) ; TONELLI, Sara (ed.) ; and ZANZOTTO, Fabio Massimo (ed.). 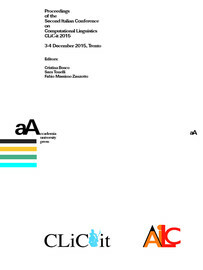 Proceedings of the Second Italian Conference on Computational Linguistics CLiC-it 2015: 3-4 December 2015, Trento. New edition [online]. Torino: Accademia University Press, 2015 (generated 19 avril 2019). Available on the Internet: <http://books.openedition.org/aaccademia/1277>. ISBN: 9788899200008. DOI: 10.4000/books.aaccademia.1277. Bosco, Cristina, et al., ed. Proceedings of the Second Italian Conference on Computational Linguistics CLiC-it 2015: 3-4 December 2015, Trento. Torino: Accademia University Press, 2015. Web. <http://books.openedition.org/aaccademia/1277>.